The Moose Jaw Chamber of Commerce would like to introduce Sycamore Energy to the local area. This is your opportunity to hear from Alex Stuart, C.O.O. & Co-Founder on his thoughts of the solar industry and how it will benefit you. Whether residential, agricultural, or commercial, adding solar power is as simple as adding photovoltaic panels to a roof or landscape. Solar power can give you the comfort of knowing your power bills are capped, even when rates increase. Plus, a solar installation will save in excess of 50% on the cost of your electricity over the lifespan of 30 years. 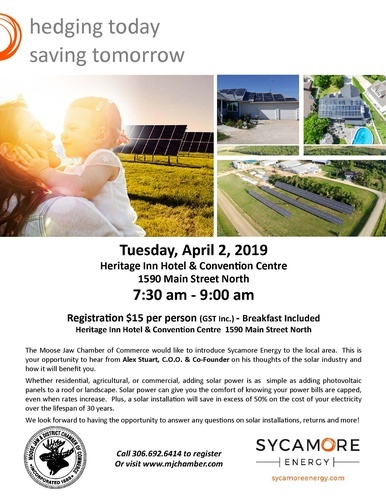 We look forward to having the opportunity to answer any questions on solar installations, returns and more!